Forte dei Marmi, only a little more than 17km from our Relais, is one of the most famous tourist centres on the Tuscan coast. 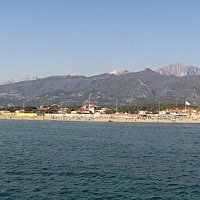 Located in the heart of Versilia, the place gets its name from the fort located in the centre of the town and from the marble of the nearby Apuan Alps, where among other things, you can go on interesting excursions in the unspoilt nature. This splendid and elegant town is characterised by a strong presence of greenery and has a wonderful beach with fine sand. Furthermore, the entire town of Forte dei Marmi offers many opportunities for fun, in fact, is famous for its exclusive stores and the night life. But Forte dei Marmi isn’t only sea and fun, it is also a city rich in history and culture that has much to offer. In addition to the Forte Lorenese also called fort, a true symbol of the city built in the late eighteenth century, you should visit the Museum of Satire and Caricature, one of the most important museums of its kind in the world, and the Church of Sant'Ermete. Also very interesting is the loading wharf, located just 300 meters from the coast, which was used to transport marble and is now used only as a tourist destination.